Little Gaijin in the Big City: Tragic Crane Collapse Locks Couple Out of Apartment; Also Crushes Building. 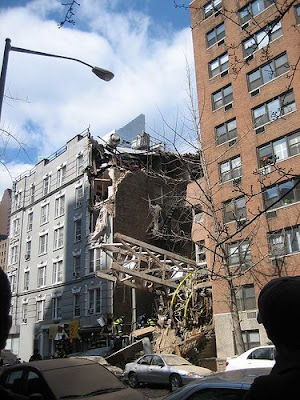 Tragic Crane Collapse Locks Couple Out of Apartment; Also Crushes Building. It was a lazy saturday afternoon like any other. I had just gotten back from jogging in Central Park, and Takeshi was in the shower after boxing. That's when the noise started - a not-so distant rumbling, then the crashing sound of something heavy hitting several tons of brick. Then a few seconds - again. BOOOOOOOMMCCRSHH!!!! Ok you can tell I write comics, trying to think of sound effects like that. I rushed to the window, and saw nothing but dark clouds of billowing dust. "GODDAMNIT! It's that DAMN CRANE! It finally FELL OVER, I KNEW THIS WOULD HAPPENNNNN!!!" I yelled, running in circles trying to find the camera. 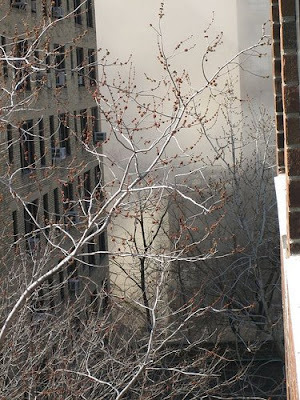 Takeshi leaped out of the bath and ran to the window, seeing the plumes of dust rising to the west. I finally found the camera and he pulled on some clothes and we rushed downstairs. The doorman was not in the lobby. We found him on the doorstep of the apartment, where a small crowd had gathered to try to make sense of the noises. Then we saw and I knew I had been right - the crane about halfway down the block had fallen over, and was balanced precariously on a tall brick building directly south (and across the street) from the construction site. Ok, so that didn't happen. But I was right to be scared of it. Saturday was perfect weather, only partially cloudy, and more importantly, no wind. That crane toppled in perfect weather, and when I saw how it had fallen, I couldn't help but feel incredibly lucky that it didn't fall into the street. That's when we realized we were only seeing half of it. 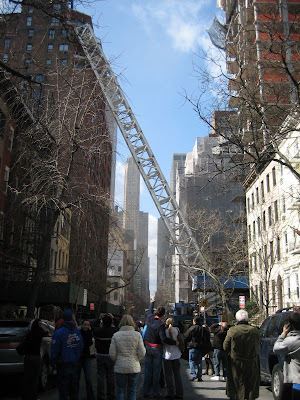 The top of the tall building on the south side of 51st had served as a severing point for the crane, breaking the top part off and (this being a very tall crane), crashing down on the north side of 50th. We ran around the block to see. The building directly in the path of the crane happened to be the runt of the litter, only 4-5 floors compared to the surrounding 10 story buildings. The taller buildings seemed to shrug off the crane, and deposit it on their shorter neighbor, which was completely crushed by the weight. The police and firefighters were already on the scene, even though this was at most five minutes after it happened. Luckily the 17th precinct police department on 51st and 2nd were fast on their feet, and were already in the process of rescuing some poor soul who had been trapped in the builing. We headed out later to meet a friend for dinner, when we passed a blockade and were told we would not be able to come back in for an undetermined amount of time 'in case of secondary collapse'. "Hey guys, so what do you wanna do tonight?" said our friend Ken. Poor guy. We had a fun time in Korea Town in a shady karaoke bar and went back to his apartment and played Star Wars Legos, and lucky for us he had a fold out couch. By the time it was around 12, I tried calling the city. 3) we could find out more info by going to 57th and Lex. (we were across town). "So are you staying over?" I blinked my eyes in doe-eyed fasion, thinking of the horrible trek home in the cold, only to be (possibly) turned away. "Yes please!" This morning we were able to get back in by showing ID, but cable is out, and the cable guys aren't scheduling fixes until, reasonably enough I SUPPOSE, they can get back onto our block. And this is why I read all of Orson Scott Card's Invasive Procedures in one day today. I probably should have done my taxes, as an afterthought. I am extremely dissapointed the press did not end up using my particular photos, but the link is here for alert readers. Geez! Glad you guys were safe! Thanks, me too.. luckily there were very few casualties considering the size of that thing. I just feel bad for the people down the street who have been permenantly evacuated from their apartments. Holy crap... crazy. I should ask my bro about it, he lives somewhere in the city, lol. btw, the ice cream thing - they have the purple stuff around (in Den-Den Town, too, I think), but I've never seen it to be a standard flavor like that! Tipping isn't a city in China?! Dear sky, please stop snowing. From Kyra. Rocking out on Thanksgiving !m!